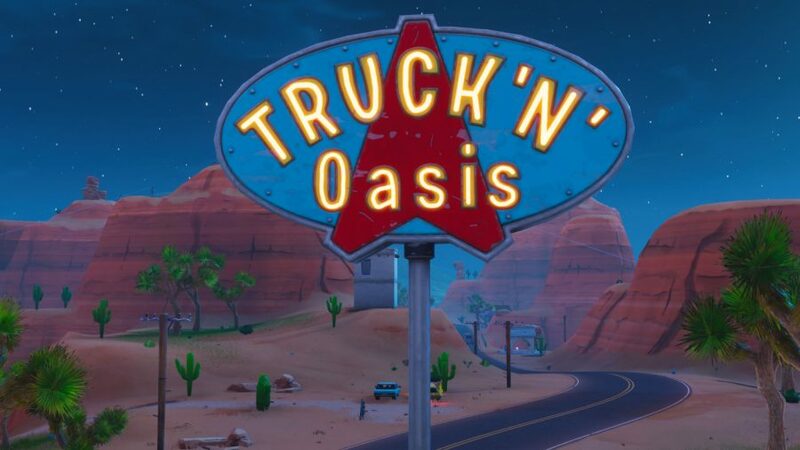 Where is the trucker’s oasis in Fortnite? There’s an inescapable feeling of excitement in the air as Marshmello is set to take to the stage in Pleasant Park, but we still have some quests to complete to keep us going until then. In this first part of the three-stage Showtime, you need to use the Keep it Mello emote at a Fortnite trucker’s oasis. This three-part mission is one of three total Showtime challenges that have appeared in the game to celebrate DJ Marshmello’s live in-game concert in the tranquil battleground of Pleasant Park. Here’s hoping all the gig goers make a concerted effort to lay down their brightly-coloured arms so everyone can enjoy the performance. Anyway, let’s crack on with finding the Fortnite truck stop sign. If you complete all three stages of this challenge you will have a fresh new Marshmello-inspired emote, Keep it Mello, with which to properly show your appreciation to the visiting DJ. For successfully finishing the other tasks you’ll get the Mello Made it Right spray, the Marshy Smasher pickaxe, and a banner. So, how do you get them all? You can start by dancing on top of a Fortnite truck stop sign. We’ll be dropping over to the arid plains of Fortnite’s desert biome for the first part of this dancing challenge. The oasis is near the petrol station if you follow the main road south-west from Paradise Palms. 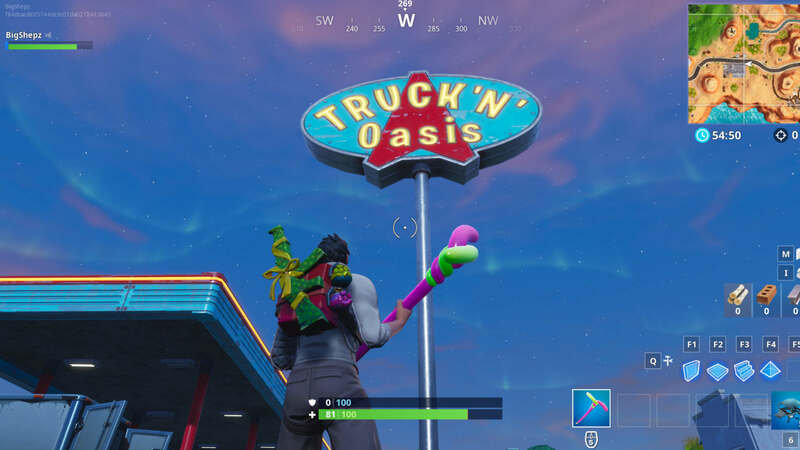 There’s a towering sign that says ‘Truck ‘N’ Oasis on it – you can’t miss it. 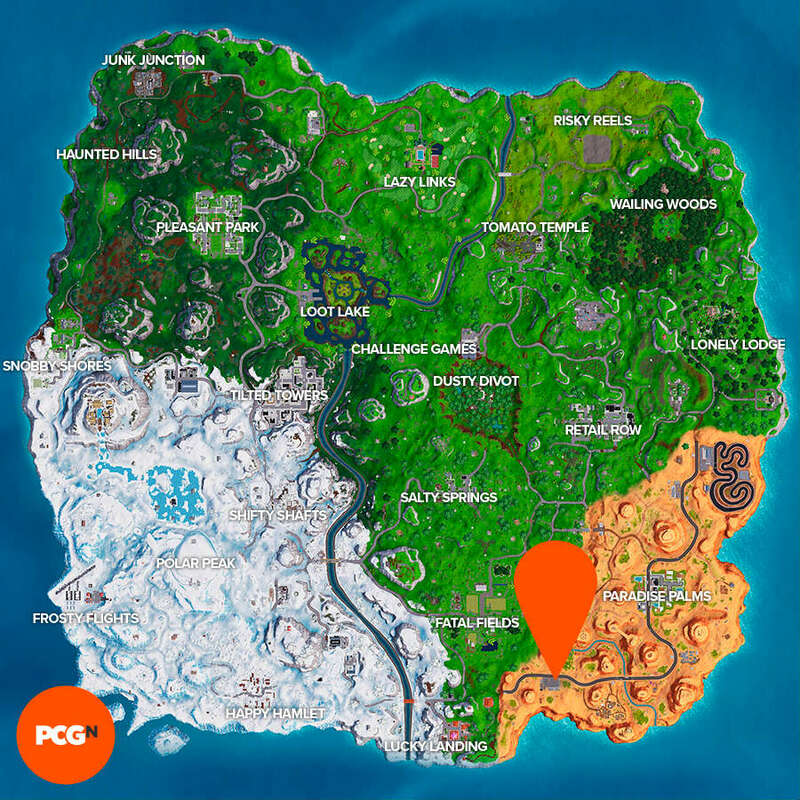 Then all you need to do is use the Keep it Mello emote you get by visiting the Fortnite Showtime venue. On the map and screenshot below you can see the spot in question. And there you go, that’s where to dance on top of a truck stop sign in Fortnite. As we mentioned, there’s even more for you to do when it comes to this special batch of challenges, so here’s where to search a Fortnite Showtime poster to complete the first one. And, with that all done, we can just count down the hours until Marshmello takes to the stage.